My first week of unemployment has been a busy one, filled with all sorts of events. In addition to following up on some additional job leads, I have accepted a freelance project with a former vendor that will give me a few weeks’ worth of work, and I am also providing pro bono organizational development consultation for a friend’s family company. Who knew unemployment could keep you so busy? Near the office of our condo complex is a small pool with koi fish. 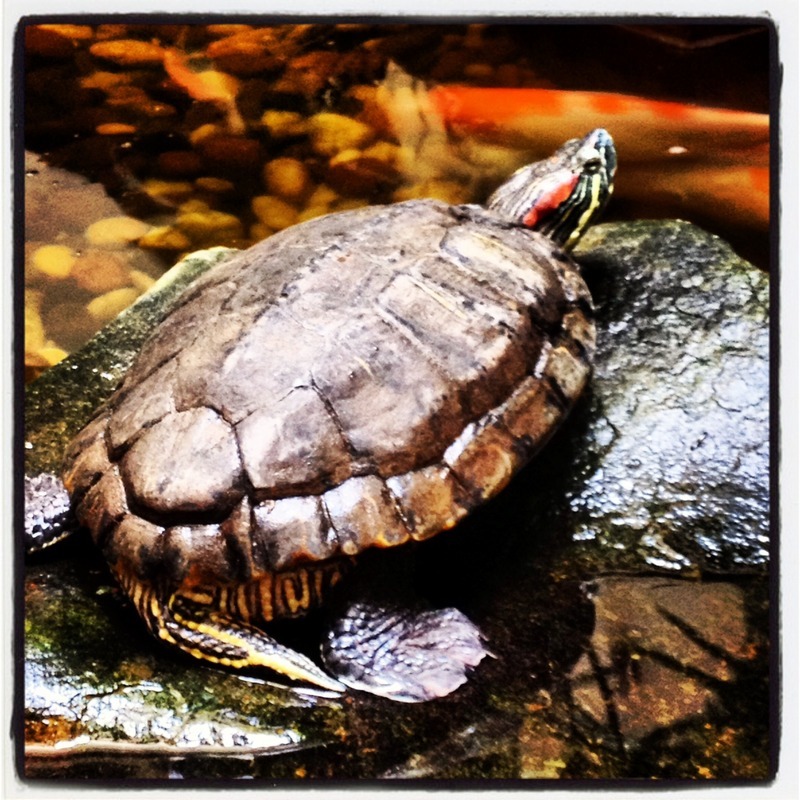 It has a resident turtle who likes to sun himself on one particular rock. He was a bit jumpy as I approached to snap this picture so I had to move slowly and be patient. Over the past week, we have had very humid air which has resulted in some spectacular sunsets. 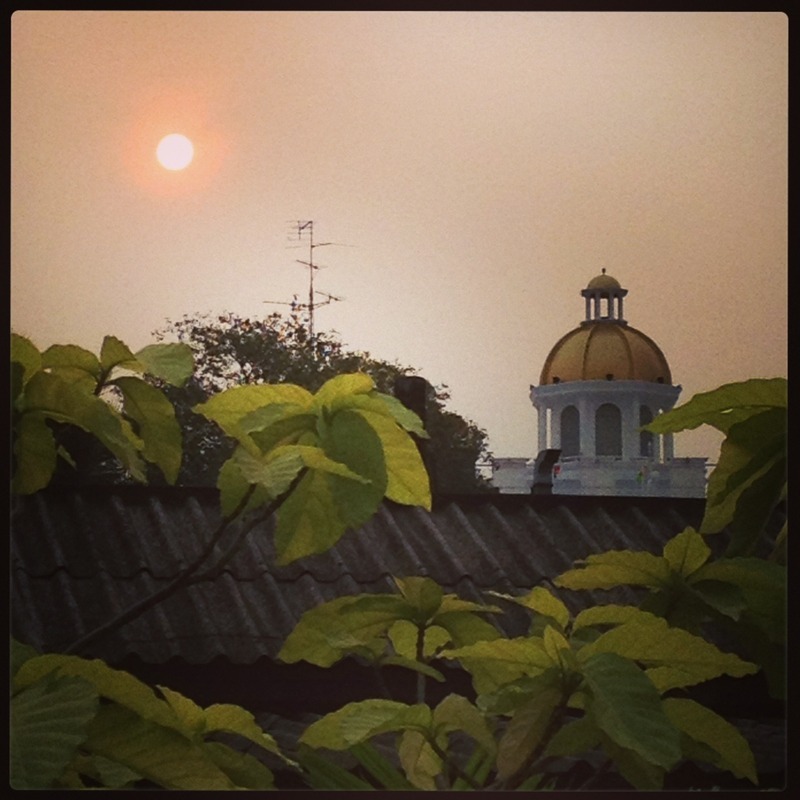 This one was taken while driving north from the Lad Phrao area to attend an evening performance of “Mulan Jr.” by a bilingual primary and secondary school owned by a friend’s family. This picture captures the common sight of power and telephone lines which blight our view. Warmer temperatures after our very brief (and not very cool) cool season has led to an explosion of blossoms on the trees. Lasting a few short days, these pink blossoms are very pretty but a terrible mess to sweep up once they fall. The humid weather has also produced some nice sunrises, although because of where our condo unit is situated, we can’t see them this time of year. One morning I was out on an errand to a convenience store to pick up some milk for coffee, and caught this sight of the sun rising over one of our wealthier neighbor’s Italian style home. Ostentatious, isn’t it? I wonder what the rest of the house looks like. I have been cooking a bit, although not taking many pictures. I roasted some butternut squash from a friend’s organic farm to make a nice soup and also the filling for some ravioli. 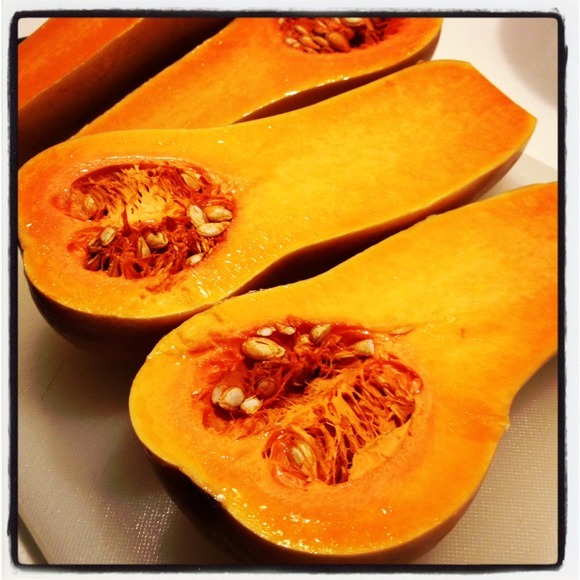 The squash had a lovely orange color and a sweet taste once roasted. While crossing Sukhumvit Road, one of the main arteries in Bangkok, I caught this picture of a quarter of Bangkok Metropolitan Authority workers riding on top of a city truck. A warm day, I guess this was the best way to catch a breeze and stay cool! 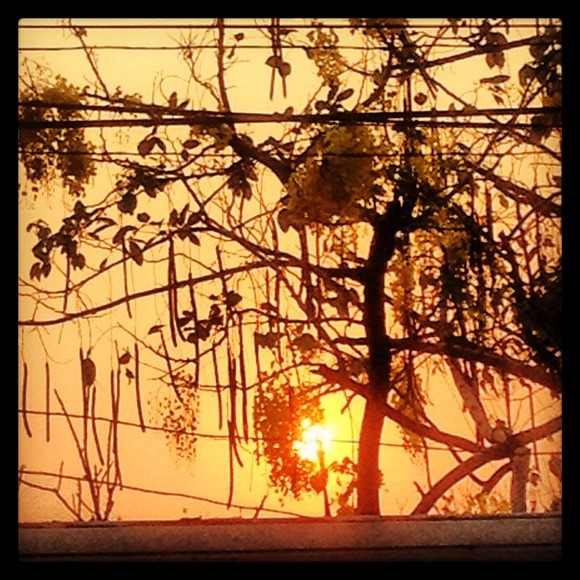 This entry was posted in Uncategorized and tagged Bangkok, Instagram, Pictures by christao408. Bookmark the permalink. These are great photos and I am going to go and look for Instagram for my droid. I use my phone camera a lot when I am wandering the halls of walmart and big lot<:)The photo of the turtle sunning himself on the rock in the koi fish pond, and the blossoms on those trees are beautiful.Sending good vibes for your job search, and you both have a wonderful week coming up again way to fast. Wonderful shots, Chris. I love the ‘mansion. Oh, now you are part of these Instagrammers. *grrrr* Glad to hear your unemployment is keeping you busy. I think that’s good. The Sunset was great! I love the composition. Using cell phone to take pics works when you don’t have a camera. Yours turned out exceptionally well. I have a dumb cell phone. Family is trying to talk me into joining the human race by getting a smarter phone..
Love the pics! Would love to follow you on Instagram . What will be the latest device? I am thinking Chromebook might be positioned to take over the regular computer. Chromebook will bypass Microsoft and maybe use a less hungry for power cpu.It is often not just luck that will help you get a job. Networking and connections is a powerful factor in getting jobs too. It’s a house? I thought that was a church or temple. 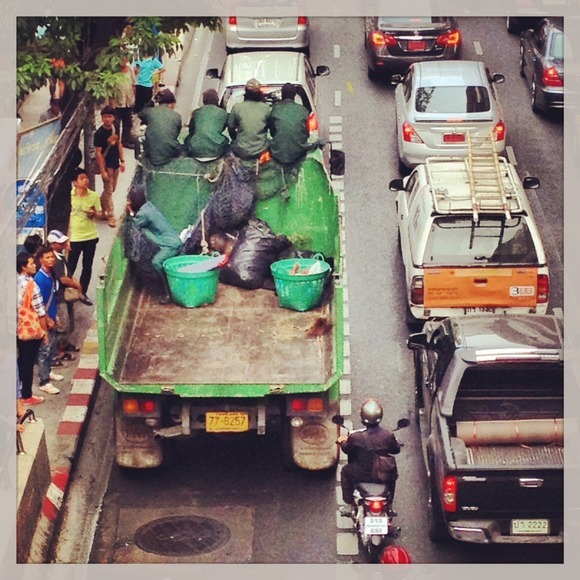 Someone should tell those workers it’s not safe to sit up there but I guess with the Bangkok traffic, that truck isn’t moving fast. i wish you blessings with your job search and your photos have always been nice to look at. they make me hungry! @ElusiveWords – There you go again Matt, imposing your imperialist western values like “safety” on other cultures. @Composing_Life – Thank you very much. I aim to make people hungry! @PPhilip – No doubt about the power of networking, especially in a society such as Thailand which is much more communal versus individual oriented. @murisopsis – Thanks. Glad you enjoyed the pictures. @l0311879l – Okay, will search for you. @awoolham – Username is christao408, feel free to follow. Although you might discover in the future that many of the pictures there end up here, too! =D@armnatmom – It was only late October when I finally purchased a smart phone. While I’m pretty technologically savvy, I’m not always an early adopter if I don’t see the need for it. The smart phone is handy but I’m sure I could live without it. @Fatcat723 – Thanks; it is interesting to have to start thinking in terms of a square aspect ratio when I’m used to a wide-screen one. @beowulf222 – As the line from the Nickleback parody song goes, “Look at this Instagram / Eggs Benedict, side of ham / Started as a lemon tart / and then my phone went and made it art.”@snowjunky8 – Glad to hear you’ll be here. Jason and Daniel will be down from Shanghai, too. Do you know Jason from Xanga? (Chu, not Wang)@CurryPuffy – Trying to diversify. LOL@slmret – @stevew918 – @Table54 – Thank you; glad you enjoyed. 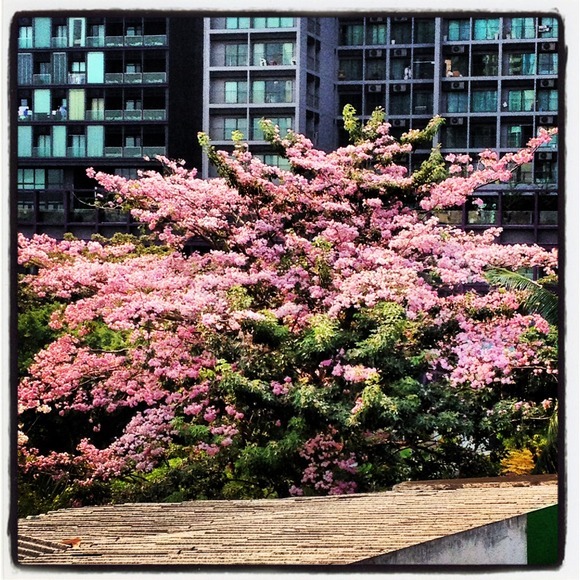 @Grannys_Place – In addition to Instagram, I think there is a similar application called Hipstamatic. I’ve been unemployed for three months now, and the entire time has been super busy. I’ve been writing a book, going hiking every day, working on my portfolio, and working as a stagehand for a community theatre. @ElusiveWords – Ha ha ha… actually, the other day I was watching the new Emporium 2 construction site, easily visible from the Phrom Phong BTS skytrain station platform, and noted that all of the workers are wearing boots and hard hats. I remember seeing other construction sites not so many years ago that had laborers wearing flip flops and no hard hats. My imperialist values are catching on! @angelwingfive – Glad to hear you have found ways to keep occupied. Best of luck in your job search! Nope don’t know that Jason..but if he’s going to Song Kran might meet him. Am staying at the Grand Hyatt this time. Downloaded Instagram. Never got the hang of it. @snowjunky8 – There is a very nice, reasonably priced afternoon tea at the Grand Hyatt. @Inciteful – I agree; it is not intuitive. While I like taking pictures with it, I don’t spend much time browsing others’ pictures, etc.